Our product range includes a wide range of circular lifting magnet and lifting magnet. 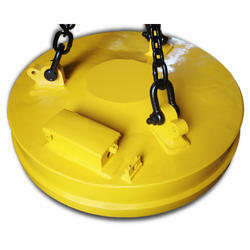 Circular Lifting Magnet are provided by us at market leading prices to our esteemed customers. We are a prominent exporter of the same. Mechanical construction of EMF -Technology high capacity lifting magnets is very sturdy to meet toughest demands in service. The one piece magnet body is cast from high-grade dynamo steel or Mild Steel. Underneath, between centre and outer poles, the magnet body is closed by sturdy, cast and rib-reinforced non-magnetic austenitic manganese steel plate. Fastening at the centre pole is affected by means of a shrunk-on ring and at the outer pole by locking ring. The standard three-fall chain suspension, designed with common suspension ring is rated to meet all normal duty loads. Special change is available on request for extremely heavy loads. Two lugs for guide ropes are fitted as standard. Higher resistance to thermal strain. Coils are cast into their magnet body with a special resin compound of excellent heat conductivity and thus rigidly fixed in position. In special cases, coil can be furnished with copper conductor. Use of special resins loaded with fillers as sealing compound ensures reliable conduction of heat to the magnet surface, maintaining high magnet performance over long, continuous service. All insulation materials confirm to class " H"
The permissible relative duty factor is 75% / 10 mins. or 60% /10 mins. depending on magnet construction and application. The standard operating voltage is 220 volts DC. Magnets for extra heavy duty available on request. 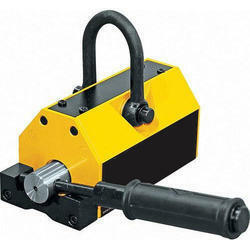 With wide industrial experience we offer standard Lifting Magnet for Heavy Loads, material, machines, etc. These are widely used for moving the material from one place to another. Looking for Lifting Magnet ?